Last year, natural disasters had a huge impact on mine production and financial worries had a negative impact on base metal prices. Although no one knows what Mother Nature has in store for this year, the inability of policymakers to come to grips with financial matters remains center stage. Taking these issues into account Natixis recently published its First Quarter 2012 Metals Review. Despite a rapid increase in demand for aluminum, a sustained increase in supply kept the market in substantial surplus in 2011. With aluminum prices depressed and costs of production rising, aluminum companies are closing higher cost facilities to bring the market back into balance. Natixis projects aluminum prices rising modestly to an average of $2,250/metric ton (mt) in 2012, but significant downside risks clearly exist. After a period of significant destocking in 2011, Chinese apparent demand for copper is expected to increase more rapidly than the 6%-7% increase in end-user demand. Prices may push significantly higher in 2012 as global stockpiles drop sharply. The forecast calls for average copper prices of $9,250/mt in 2012, before prices stabilize just below $10,000/mt in 2013. The lead market experienced a “distinctly schizophrenic year in 2011,” according to Natixis. During the first half of the year, backwardations on the LME suggested a high degree of physical scarcity just as metal flooded into Asian warehouses, but in the second half of the year lead prices fell back (with LME markets shifting to contango) just as global stockpiles began to recede. For 2012, Natixis sees the recent tightening of the market in China as being indicative of more balanced fundamentals this year, with a reduction in the global surplus to just 34,000 mt able to support average lead prices of $2,375/mt. Like lead, the tin market can be accused of flagrantly ignoring fundamentals for much of last year. During the early part of the year, prices pushed up to all-time highs above $33,000/mt, long after Chinese demand had gone into reverse. 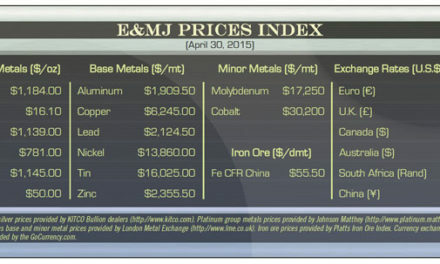 The tin market is in danger of moving toward acute physical scarcity over the coming two years. This could propel tin prices back up toward, if not in excess, of last year’s highs. The nickel market confounded almost everyone last year, with expectations for a significant surplus being met instead by a drop in LME stockpiles of 45,000 mt. Nickel prices should be well supported between $18,000-20,000/mt, suggesting an average for the year of perhaps $22,000/mt. 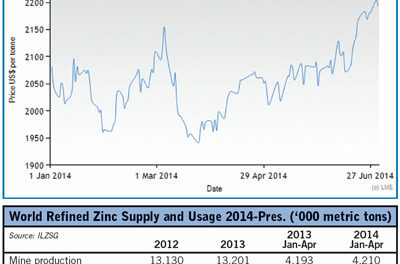 The zinc market has struggled with persistent surpluses in recent years, as modest growth in demand has been swamped by an increase in supply. Much of this oversupply can be traced to a major inventory cycle in China. The market looks to be in a better fundamental position in 2012, although we may need to wait until 2013 before deficits can begin to erode the substantial global stockpiles that have accumulated over the preceding six years. Zinc prices are expected to advance modestly over the coming two years, with average prices of $2,225/mt in 2012 and $2,400/mt in 2013. The full 56-page report is available from www.natixis.com.